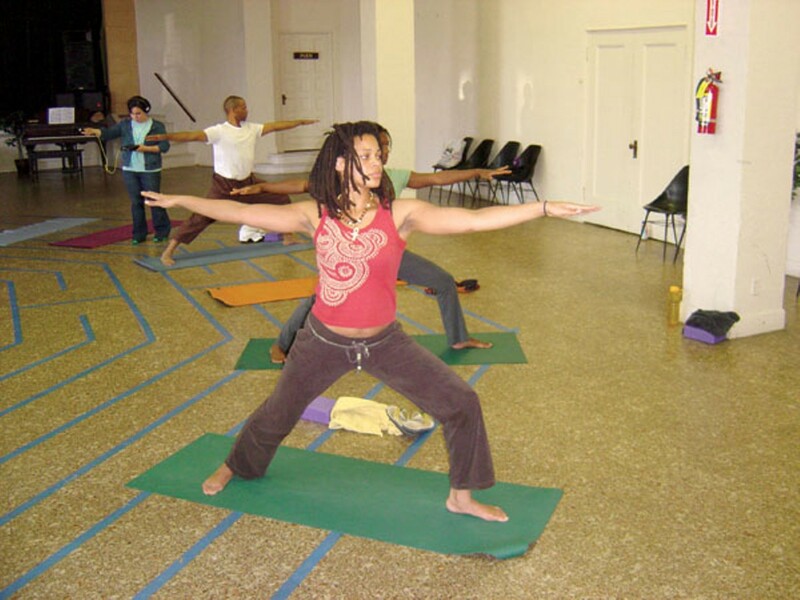 Minority students in a Niroga yoga class train to be Integral Health Fellows. To get to and from their classroom in Unit 6 at the Alameda County Juvenile Hall, the Niroga Institute's yoga teachers pass through five locked doors and walk down yards of dun corridors that hold that closed-in smell of laundry, disinfectant, and overcooked food. Program coordinator Annika Hanson always makes a point of asking new students their impressions of yoga. "'Okay,' I say, 'It's white ladies bending over, right?'" she recalled. "'Yeah,' they say. I tell them that isn't it at all, just the way it's marketed in the US." The Oakland-based Niroga Institute seeks to take yoga out of the world of the pale, privileged, and pliable. Giving thought to where, how, and to whom yoga is taught, the institute aims to make the practice a tool for healing communities at their sorest points. "We're looking for a generational transformation of vulnerable youth," said Niroga Institute Executive Director Bidyut K. Bose. "Yoga is a time-tested tool for personal transformation." Consequently, the five-year-old institute runs about a hundred classes a week in juvenile justice facilities in Alameda and Contra Costa counties and at community centers, high schools, homeless shelters, and group homes around the East Bay. It has certified some 125 teachers to give those classes. Last May it graduated its first class of "Integral Health Fellows," thirteen African-American and Latino yoga instructors who studied in a program funded by the Bay Area Black United Fund and the Alameda County Health Care Services Agency. "These kids are in crisis all the time," said Yahru Baruti, a senior psychiatric social worker at Juvenile Hall who's worked with youth for 25 years. Yoga teaches self-discipline and gives youth tools they can use to break the cycle of violence, Baruti said. "Staying on your own mat" becomes a metaphor for not getting involved in other people's issues. Remembering to breathe and slow down for a moment can stop angry blowups. From their various perspectives, the institute's students, teachers, counselors, and researchers nonetheless see similar benefits to the classes. On a recent Tuesday morning, ten sleepy young men roll into class in Unit 6 and settle on their mats on the scuffed linoleum. Instructor Alexa Bach explained how the yoga principle of "ahimsa," non-violence, can change the way we relate to ourselves. "Ahimsa talks about treating ourselves well, watching how we talk about ourselves, and the kind of thoughts we put in our heads," she said, then asked the students to each say one positive thing about yoga. One piped up, "Yoga brings you down when you're all. ..." He mimed the thoughts churning in his head. Genai Powers, who took Niroga classes at Oakland Emiliano Zapata Street Academy, an alternative public high school, said yoga turned her life around. "When I started doing yoga, I started to get myself together," Powers said. "Before, I was into partying. Yoga got me in touch with myself. I started going to work, doing more positive things. I don't feel like the same person." Now the tall, athletic teen is a student at Chabot College and in the second cycle of Niroga's Integral Health Fellows program. "I've watched quite a few kids develop in their yoga practice over a period of time," said Niroga teacher Antonia Fokken. The quiet that yoga brings to mind and body leads naturally to self-control. "When we feel peaceful inside, it is easier to listen to ourselves and each other, to have compassion, to slow down before acting, to put ourselves into the shoes of someone else, and to treat others as we would like to be treated," she said. Many of Niroga's teachers also found their own healing in the practice. Dr. Marcus Lorenzo Penn, one of the first Integral Health Fellows, came to yoga while he was in medical school at Howard University six years ago. It helped steady him as he cared for his mother through her losing battle with brain cancer, and today he shares that experience with his own students. The fellows pay for their training with a hundred volunteer teaching hours in the community. Bay Area Black United Fund Executive Director Woody Carter said Penn and the other fellows will play a critical role in spreading yoga and its health benefits to diverse communities. "It's important for our young people to see people who look like them delivering these services, to build the capacity of the community to provide training that's coming now from the outside," Carter said. In his work as an educator, Penn talks about health care as a river. Downstream is treatment, upstream is prevention. Yoga fits in the upstream pool and he feels strongly about bringing it to people who have been priced out of classes or put off by the common image of the practice. He does his best to bring the focus back to the basics. "People think that to do yoga you have to be flexible," Penn said. "I speak of it as conscious movement with breath. Inhale, exhale, washing dishes or mowing the lawn. Grandma rocking on the porch and gazing into the evening, that's meditation. ... I do believe yoga can be a healing tool for our communities." To learn if and how that healing is happening, Niroga has worked with several independent researchers. Ai Kubo, from the Kaiser Permanente Division of Research, and Rebecca Matthew, from the UC Berkeley School of Social Welfare, applied basic psychological testing tools to Niroga's programs at the Alameda County Juvenile Justice Center and at El Cerrito High School. Psychometric tests, such as the 10-point Perceived Stress Scale (PSS), ask participants to answer simple multiple-choice questions, assign points to each answer, then add the answers to score the test. In a study of 165 youth at Alameda County Juvenile Hall in 2006, Kubo found, "Those who attended yoga more regularly were at significantly better general health, had better self-awareness, and had lower stress measured by the PSS scale." Using the PSS and the thirteen-item Tagney Self-Control Scale, Mathew found that El Cerrito High School students who took part in the Niroga program showed "significantly greater self-control" at the end than those who did not. "Social science research says self-control is critical," said Niroga's Bose. "It affects every element: education, physical, and mental health." In conversation, Bose switches fluidly from the practical to the philosophical, noting the essence of yoga that cannot be measured. "The very meaning of the word is to join, to connect," he said. "We are all gems connected by a single thread, as it says in the Bhagavad Gita. If we truly apply that, how can we do violence to each other, to the planet?" At the beginning of the Niroga class at Chris Adams Girls' Center in Martinez on a summer afternoon, students chatted and pouted. Others danced into their poses. But by the end, the ten young women stood tall in a circle, balancing on one foot in tree pose. Instead of holding their hands over their own heads in the usual prayer position, they turned their palms outward, pressing the hands of the girls on either side, supporting each other, connected.